Please note the word Partial. This is a partial estate with ONLY Miscellaneous . The house has been sold & ALL of the furnishings to the new owner. However this is a HUGE home, so there is a very large amount of great merchandise. The Esco family originally from Indiana moved to Thomaston many years ago. Mr. James Esco had his own bakery in Indiana early on and eventually merged with Colonial Bread Company. James/Jim Esco and his wife were the inventors of “ Stove Top Stuffing.” The rich history & stories of the Esco’s life in Indiana are really amazing & I have very much enjoyed the family history from my client; one of the Esco sons. The Esco’s traveled all over the world and you will find many eccentric antique collectibles from many foreign countries. Here is just a brief list below. 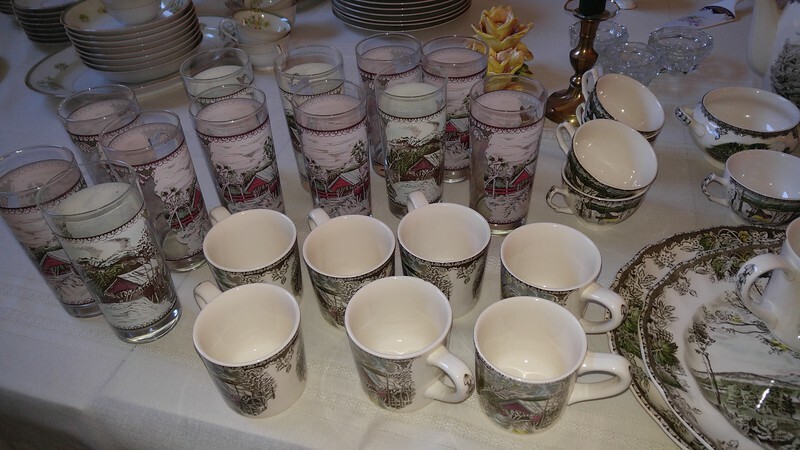 * Large collection of Johnson Brothers dishes "Friendly Village"
Many Many pictures to post! & several,video's will be posted today ( Wednesday the 15th) & I'll show you around this wonderful full of "everything quality & good"
Thank you from me & The Kelly Crew!